It is not every day that an actor gets to co-star with a former prime minister. Thus, award-winning actor Faizal Hussein, 48, considered it an honour indeed to share screentime in his latest film with Tun Dr Mahathir Mohamad. “He is my favourite prime minister,” says Faizal. Mahathir makes a cameo appearance as himself in Kapsul – what Faizal calls “a patriotic science-fiction film”. Opening in cinemas this Thursday, the story centres on an IT expert named Zohri (played by Faizal) who opens a time capsule. 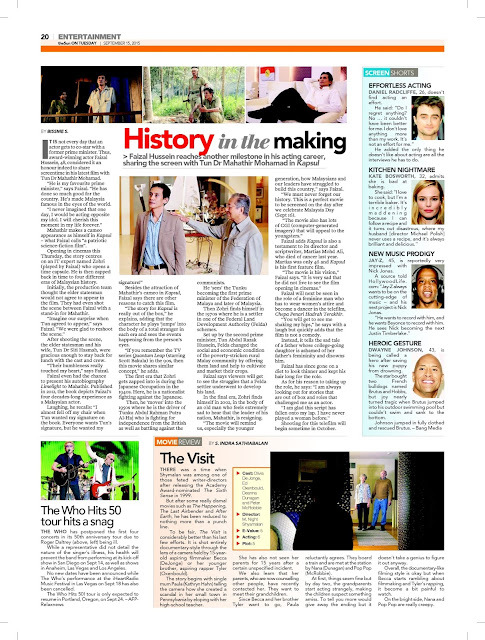 He is then zapped back in time to four different eras of Malaysian history. Initially, the production team thought the elder statesman would not agree to appear in the film. They had even shot the scene between Faizal with a stand-in for Mahathir. “Imagine our surprise when Tun agreed to appear,” says Faizal. After shooting the scene, the elder statesman and his wife, Tun Dr Siti Hasmah, were gracious enough to stay back for lunch with the cast and crew. “Their humbleness really touched my heart,” says Faizal. Faizal even had the chance to present his autobiography Limelight to Mahathir. Published in 2012, the book depicts Faizal’s four decades-long experience as a Malaysian actor. Besides the attraction of Mahathir’s cameo in Kapsul, Faizal says there are other reasons to catch this film. “The story for Kapsul is really out of the box,” he explains, adding that the character he plays ‘jumps’ into the body of a total stranger in each era and sees the events happening from the person’s eyes. “If you remember the TV series Quantum Leap (starring Scott Bakula) in the 90s, then this movie shares similar concept,” he adds. The first era that Zohri gets zapped into is during the Japanese Occupation in the 1940s. Here, he is a nationalist fighting against the Japanese. Then, he ‘moves’ into the 1950s where he is the driver of Tunku Abdul Rahman Putra Al-Haj who is fighting for independence from the British as well as battling against the communists. He ‘sees’ the Tunku becoming the first prime minister of the Federation of Malaya and later of Malaysia. Then Zohri finds himself in the 1970s where he is a settler in one of the Federal Land Development Authority (Felda) schemes. Set up by the second prime minister, Tun Abdul Razak Hussein, Felda changed the social and economic condition of the poverty-stricken rural Malay community by offering them land and help to cultivate and market their crops. Faizal says viewers will get to see the struggles that a Felda settler underwent to develop his land. In the final era, Zohri finds himself in 2002, in the body of an old man who feels extremely sad to hear that the leader of his nation, Mahathir, is resigning. “The movie will remind us, especially the younger generation, how Malaysians and our leaders have struggled to build this country,” says Faizal. “We must never forget our history. This is a perfect movie to be screened on the day after we celebrate Malaysia Day (Sept 16). Faizal adds Kapsul is also a testament to its director and scriptwriter, Martias Mohd Ali, who died of cancer last year. Martias was only 46 and Kapsul is his first feature film. “The movie is his vision,” Faizal says. Faizal will next be seen in the role of a feminine man who has to wear women’s attire and become a dancer in the telefilm, Chepa Penari Hadrah Terakhir. “You will get to see me shaking my hips,” he says with a laugh but quickly adds that the film is not a comedy. Instead, it tells the sad tale of a father whose college-going daughter is ashamed of her father’s femininity and disowns him. Faizal has since gone on a diet to look thinner and kept his hair long for the role. Shooting for this telefilm will begin sometime in October.